1. Hit the setup key. 2. Enter “5” for maintenance. 4. Enter “11” for English. 5. Enter “1” for yes. 7. Enter “1” for yes. Is there a way to fix this? Sure. But it involves a bit of fidgeting. 4. Hit the Print Test Page button. 5. Now the printer will REALLY print in grayscale. This is actually fairly easy, but there are a couple of tricks! 1. What is the IP address of that printer? The easy way is to scan for it! If you have not done so, install the arp-scan programme. Arp (Address Resolution Protocol) This will allow us to scan the network for all devices on the network. arp-scan MUST be run as root, so that’s why we do the sudo. We are limiting the search for anything we can reach, via our local ethernet connection. 5. 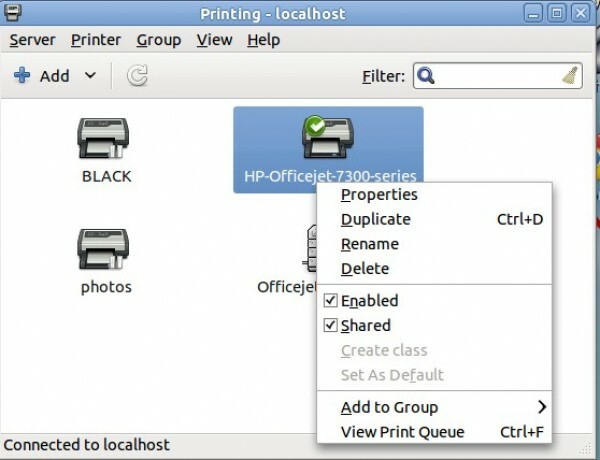 Go into: System/Administration/Printing and add your printer, if it is NOT already present. And follow the prompts for adding a printer. Almost done, couple of other chores. 8. Repeat these steps on each computer that you want to add this network printer too. Okay, by now you know that if I am asked the same question more then once in a week, the answer will end up here. It’s fairly straight forward, but there’s a couple things you might want to do. Even if you have successfully added your printer and it works, you might find out a thing or two. This is something I learned after replacing my colour cartridge twice in a month when I first started with Linux 6 years ago. This is especially true of older HP (hplip) Printers! First though, let’s add that printer! 2. Press the Add button, then forward. It will say: “Searching for Drivers” — it might take a minute or so. you will see WHY in a few minutes. Click on apply, and the printer should be added. 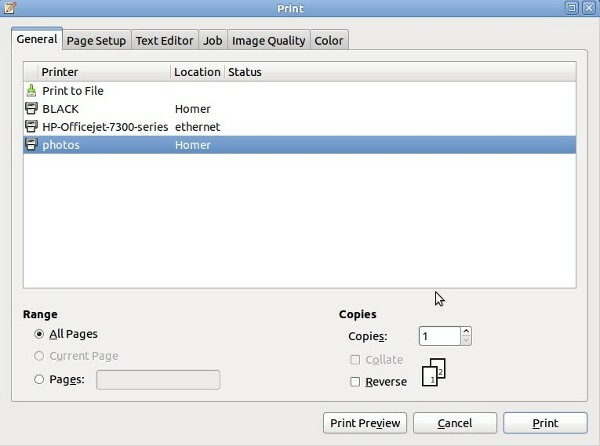 By default, Ubuntu adds the printer as a colour printer. And everything works great. BUT, what’s happening is that it really is using your colour cartridge to make the black ink. Expensive! So how do we fix that? 3. Right click on the Printer (BLACK), and then left click on properties. 4. 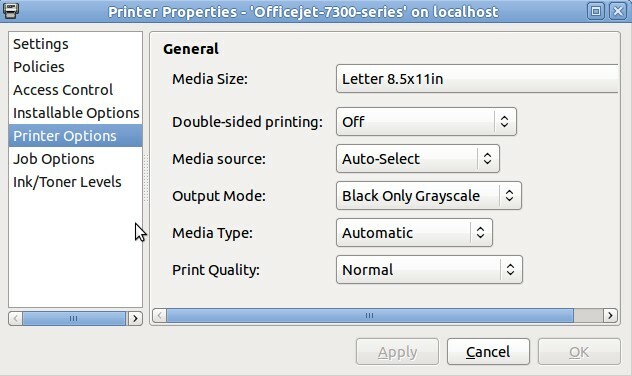 Left click on Printer Options. 5. For output mode, I chose: Black only Grayscale. 6. Click on Apply and okay. The printer will now use the black cartidge to print, instead of using the colour cartridge to make black ink. So how do you print colour? Easy. Go to print, and select the original printer. I renamed mine to Photos. So you have 2 LOGICAL printers now, instead of just one. One for black and white, and one for colour.